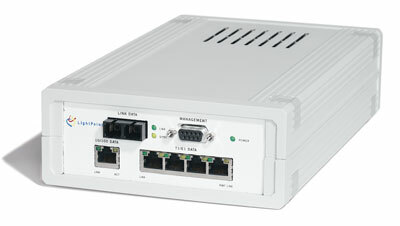 The ITD1200SE Multiplexer is a device that combines telephony signals with a computer data signal to provide a cost-effective single line for wireless transmission. It combines a standard 10/100BaseT Ethernet port with up to 4 channels of T1 or E1 voice signaling. The Multiplexer has a single RJ45 connector and a quad RJ45 connector that attaches to the LAN and T1/E1 premises equipment respectively. It also includes a standard duplex SC fiber port to connect to the Free Space Optical (FSO) link head. For system management, the Multiplexer can be managed either out-of-band through the RS-232 serial port or in-band using SNMP through the LAN Port. Multiplexer then splits the signals back into the original T1/E1 voice and LAN data signals.